Do you make your own or does it arrive as a gift from others? These days I’m a relatively happy person. But then I’m lucky – a roof over my head, a partner to share life’s ups and downs, enough food on the table and no financial worries. It’s a good start and it means I don’t wake up every day fretting about the practicalities of life. But after that, I think it’s probably more about attitude than anything else. We all know that waking up feeling cross or sad or scared (for whatever reason) sets the tone for the whole day, whilst starting out feeling positive generally results in a much better day. Gosh, I realize now that my ‘happy’ certainly originates close to home: eggs from our hens and things made from them (ice cream and French toast), a spot of mending, some (British wool) knitting and a jar of honey from some friends’ bees. The preserved fruit that went with the French toast came from further afield, but I did bottle it myself… only the maple syrup was not a product (at least in part) of my own work. Clearly what makes me happy is domesticity. How about you? First, The Sisterhood of the Travelling Sketchbook. It has been a great honour to make a contribution to this wonderful project, but today I am bidding farewell to the sketchbook and sending it on its way to The Crafty Creek. If you want to read more about it, check out its very own web site here. Second, four eggs in one day. 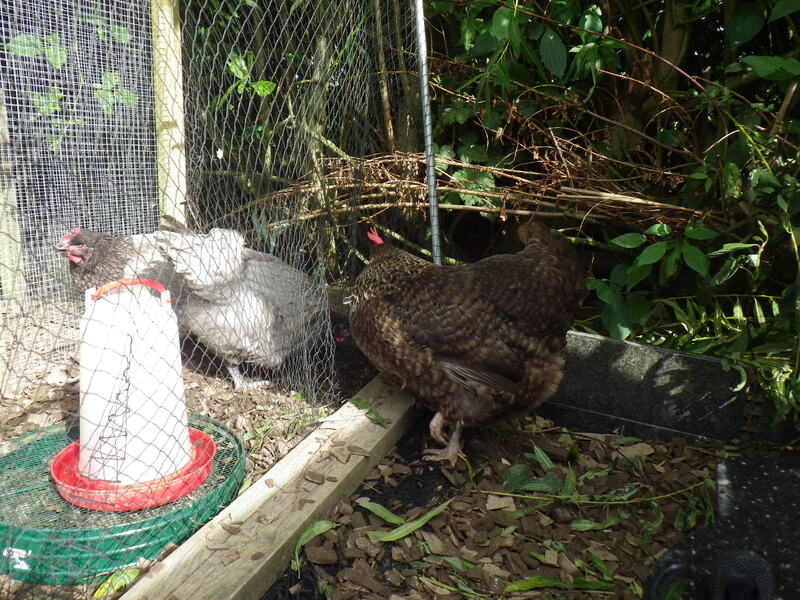 We have four hens – Anna, Tiffany, Mags and Alice. The latter three are regular layers, but Anna (short for Annagramma – the awkward one for those of you in the know) has not laid for eighteen months. Recently, however, there was evidence that she was going to start again. 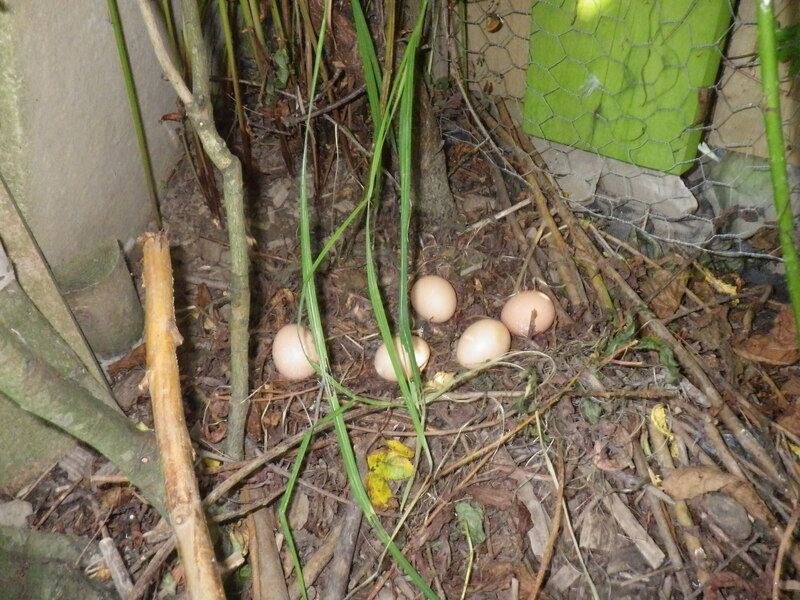 Over the past few weeks, there have been two or three eggs that might have been from her, but we have never been certain… until yesterday, when four eggs were laid. Hens only lay once each day, so four eggs means one from each hen and that means that Anna is doing her thing again. Hurrah! I generally make this with raspberries and white chocolate chips rather than strawberries, but you can use any fruit you fancy. The other good thing about this recipe is that you can use an off-the-shelf gluten-free flour if you need to and it still works well. 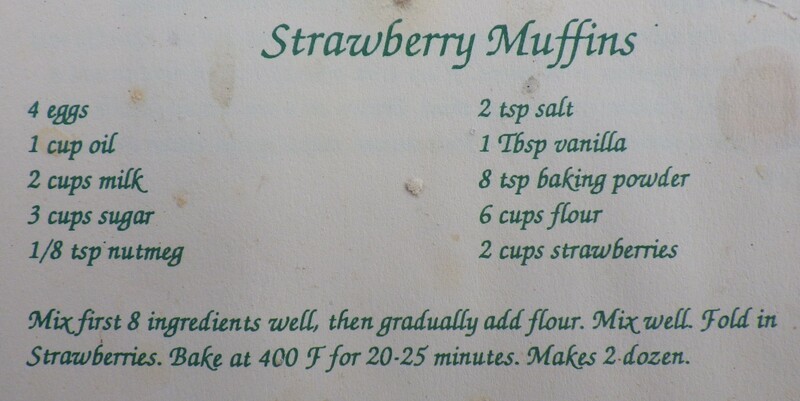 When I have whey from cheese making, I use that rather than milk and the recipe still works… honestly it’s one of the most reliable recipes that I have and the muffins are always delicious. To give you an idea of how good it is, my guests all wanted this recipe to take away and use at home (and one of them runs her own B&B). So, those are three things making me smile and that I am grateful for this week. What is making you happy? First, meeting blogging friends in person. This week has been an especially good week for this since I spent Monday afternoon with Katy the Night Owl, drinking vast quantities of tea and setting the world to rights. And then today we had lunch with Sue, a blog reader who lives in the next county to us, but whom we’ve never met before. It won’t be the last time – again there was lots of tea, plus pies and cakes. Third, a trio of eggs. For the first time in many months, today I have collected three eggs. This means that the lovely young Mags (Light Sussex) has started laying – yay! Now if Anna could just get back to it, we’d be swamped! So that’s it for this week. What are you feeling grateful for? 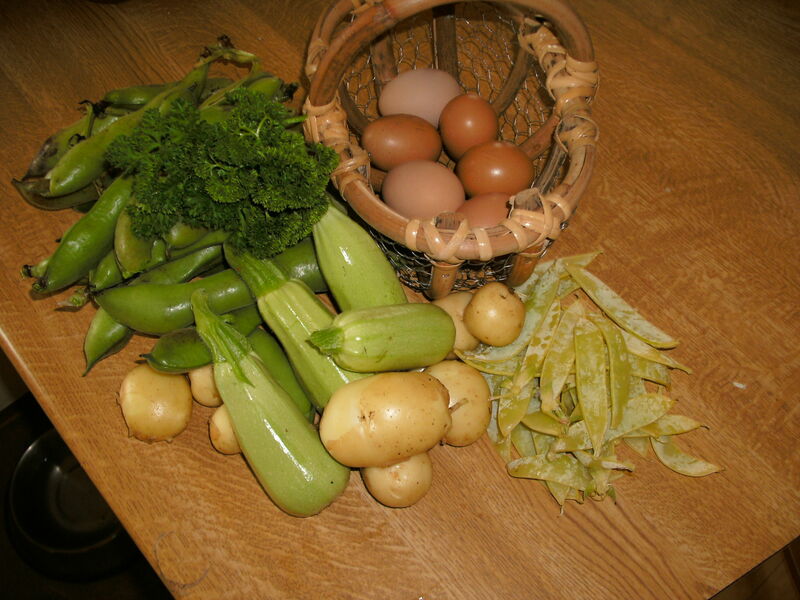 First, home-grown fruit and vegetables. In the past week we’ve had herbs, leeks, potatoes, raspberries, peppers and tomatoes, plus our first courgette. There may be rampant weeds and rampaging slugs (it’s been wet recently) but we are harvesting. And I just want to assure you that I don’t regularly molest my plants like this! Third, happy hens and lots of eggs. The new girls have settled in well. Oldies and newbies are still choosing to sleep in separate houses, but Aliss is laying in the main house. Mags has not yet started to lay, although she’s grown well and is becoming calmer and more sociable with us. It’s good to see them functioning as a single flock. In a week in which the news is full of the horror of another mass shooting, football violence and yet more refugee deaths, not to mention wild claims about the results of Britain remaining in/leaving the EU, it’s good to focus on events at a more personal level (if only to remain sane). And so, I’m delighted to tell you that one of our new girls, Aliss 2, has laid her first egg today, just 2 weeks after we got her. She’s still quite a small hen, but she managed a 43g egg. For comparison, Tiffany’s egg today weighed 76g. The first one was a good layer and it looks promising for our newbie. Do you have good news to share this week? It’s that time of year when hens are transformed from from feathery egg-producing bundles to walking oven-ready chickens… or at least it is for Tiffany. 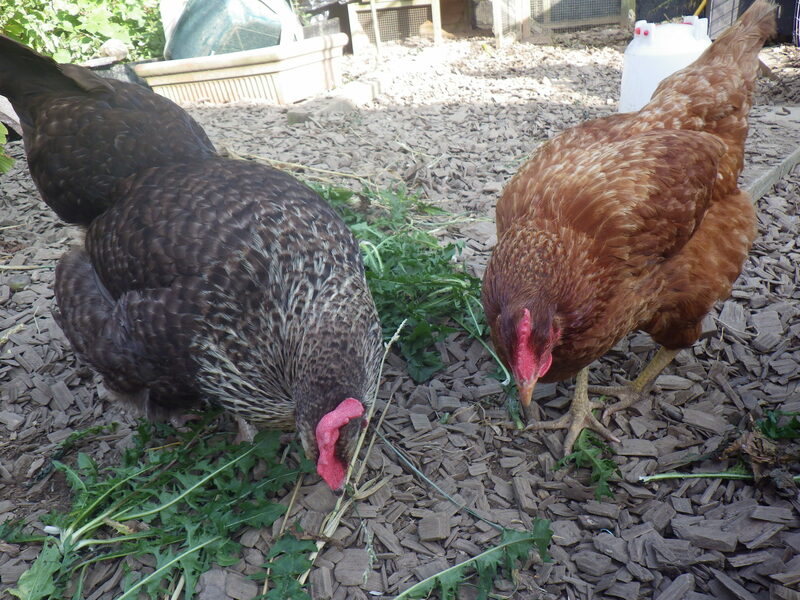 Lorna, Anna and Esme moulted last month, but this month it is the turn of our best egg-layer… which means that cakes are currently off the menu. 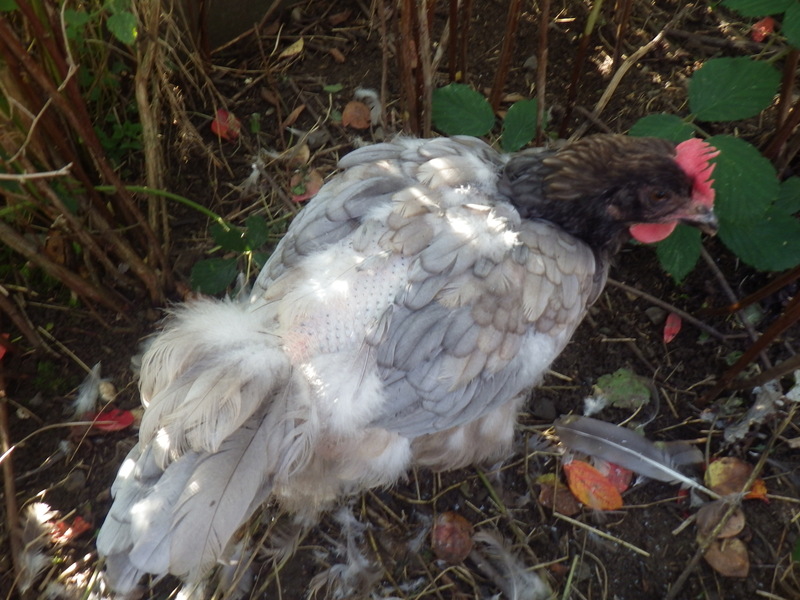 It’s hard to believe there are any feathers left on the hen! 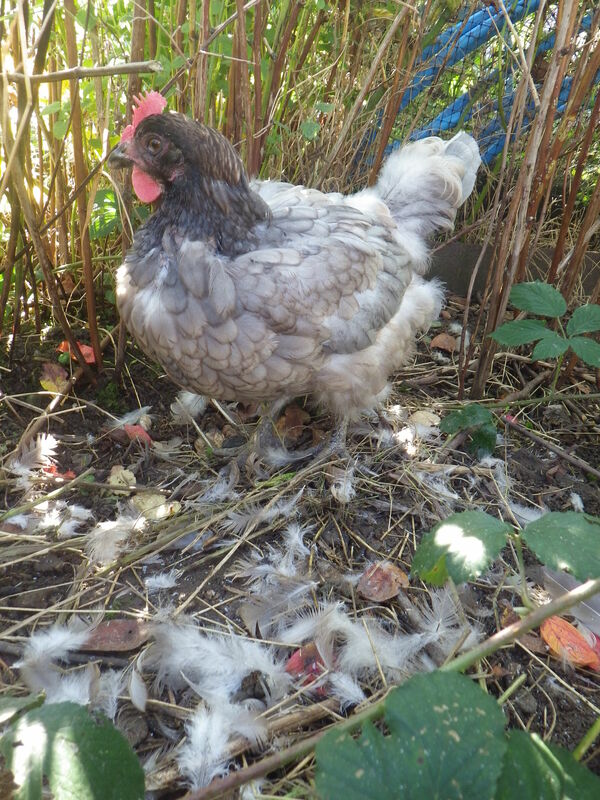 Moults can vary in their extent, with some hens losing a few feathers and some going all-out to replace the lot. The latter is what Tiffany is doing at the moment – the garden looks like it has been the site of an almighty pillow-fight and the hen house looks like a fox has been in there. In fact it’s all because of a single moulting hen. The feathers fall out because new ones are growing underneath – a bit like when baby teeth are replaced by adult ones. But all this new feather growth requires lots of energy and protein. So resources are diverted from egg-production to feather-production… leaving hungry humans! 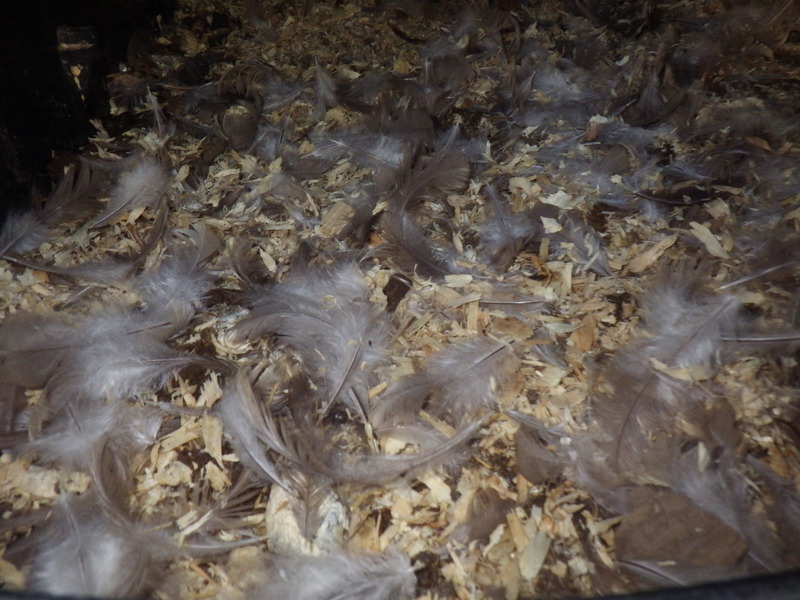 Although we miss the eggs during a moult, we do benefit from all those feathers, which go into the compost and break down over a long time, thus acting as a slow-release fertilizer. I like this sort of connection to the seasons and natural cycles… something we miss out on if we don’t produce any of our own food. Sadly we are back down to four hens after Aliss died a couple of weeks ago. This leaves us with two oldies who are rarely laying and two newbies who are providing us with a steady supply of eggs. Tiffany doesn’t lay every day, but some days she lays a small egg with one yolk, some days she lays a large egg with two yolks and some days she lays two small eggs, each with one yolk. She quickly got into the routine of laying in one of the nesting boxes. Annagramma, on the other hand lays a smallish egg every day, although these are gradually increasing in size. However, we can’t persuade her to use the nesting box and she has a preferred spot in a lovely inaccessible part of the hedge. … you see I know there’s a reason I don’t throw stuff out- you never know when it can be repurposed! They are not backward at coming forward! I knew that the Bluebells were point of lay when we got them – they were giving all the signals and were exactly the right age to start (19 weeks). I was also unsurprised that they didn’t start straight away, as the move to a new home would have disturbed them somewhat. But it did seem to be taking rather a long time for them to get going. I should have known better. I had searched the fruit cage in case someone had decided that the vegetation in there would be the ideal spot, and I’d looked under the wormery, where Lorna has been known to lay an egg in the past, but there was nothing to be seen. Then, I went outside on Thursday and could only spot one Bluebell – Tiffany. Where was Annagramma? I hunted round in all the usual places, but could not find her. I got a bowl of corn and shook it… all the others came running, but not Anna. 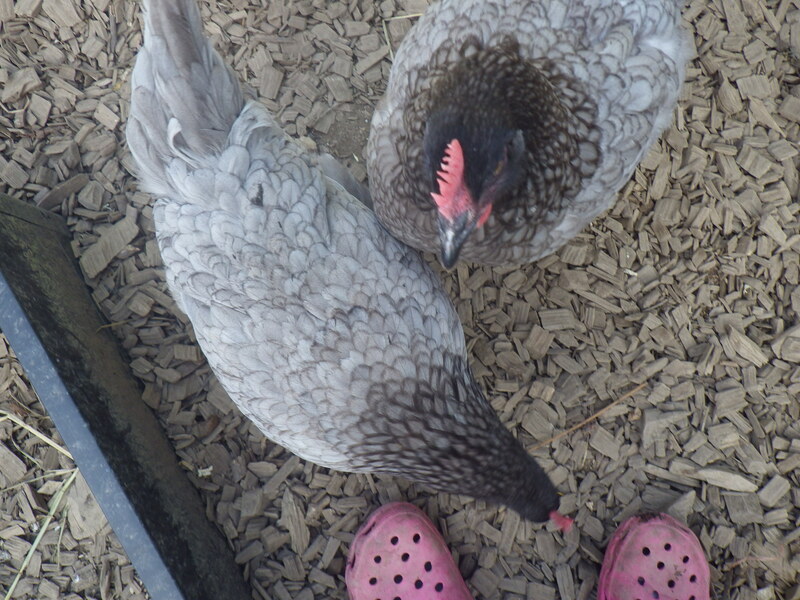 I got some mealworms and was promptly mobbed by the rest of them, but no Anna. I peered over the fence in case she had somehow got herself high enough off the ground to get into next door’s garden… and then I heard a burbly noise from deep in the hedge. I peered in, amongst the willow, brambles and blackthorn and, sure enough there she was. So, I left her to it. Great, I thought, our first Bluebell egg. Finding them was, however, somewhat easier than retrieving them. Whilst it was easy enough to stick a camera in to photograph them, actually accessing them was a wholly different matter. First, I had to move the old wooden chicken house, which was directly in front of this part of the hedge – leaving it in place was simply not an option as there was no other way in. And then I had to fight my way through a rather robust blackthorn, but I did retrieve them in the end. So, whose were they? Well, the warm one was certainly Anna’s and they all looked very similar, but I couldn’t be sure. I watched Tiffany carefully for the rest of the day, but there were no signs of laying. The next morning, however, I opened the hen house and Lorna dashed out carrying something soft and pale in her beak… a soft egg almost certainly, although she’d eaten it before I could grab her. 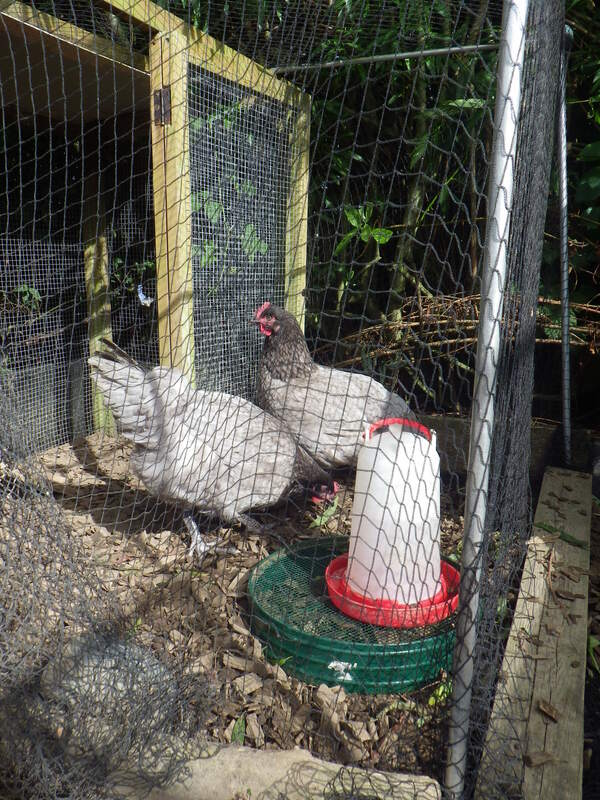 It seemed likely that Tiffany was responsible, as first eggs are often defective and anyway it was less than 24 hours since Anna and Esme had laid and Aliss and Lorna currently aren’t producing eggs. Later that day Anna showed signs of laying, so we locked her in the hen house. After an hour we let her out and she went straight into the hedge and laid an egg – typical! The next day, however Tiff looked like she might want to produce something and she went on one of the laying boxes and did her stuff – a very pale egg, much lighter than the hedge eggs. Clearly all five in the Hedge had been Anna’s. And so, we have developed a routine – Annagramma lays in the hedge; Tiffany lays in the nest box. Esme is also laying on alternate days, so we have plenty of eggs – although the ones from the new girls are very small currently. Lorna and Aliss, not being responsible for the flock, have been ignoring the new arrivals. We’ll keep old and new separated by the mesh for a while until they get used to each other and since we still have the old wooden chicken house, they can sleep separately too for the time being. Last time we introduced newbies we tried to get them together too soon, but now we know better and we have the space to allow a gradual introduction. Sometimes life makes you put all your eggs in one basket, but it doesn’t tell you what kind of basket you have to have. Get a rubber one with springs on the bottom. Some of my eggs in a basket!